* Dr. Houser PAGE: Klamath Dam science whistleblower page: Dr. Paul Houser, hydrometeorologist, and expert scientist on "Scientific Integrity," was the highest level scientist in the Bureau of Reclamation, and the only scientist in the D.C. office. Houser was fired for exposing the Secretary of Interior's "intentional falsification," "bias," and "predetermined intention" to destroy the Klamath dams. * Simplified 3-page letter to Siskiyou County legal counsel Thomas P Guarino from scientist Stephen Koshy on catastrophic Klamath dam collapse. Koshy called and explained to KBC News that there will be a catastrophic collapse if Klamath dams are destroyed, costing lives and at least $5 billion to clean up. He sent his detailed warning to the Bureau of Reclamation but they did not respond. 4/15/12. * "Upper Klamath Lake TMDL is based on the false assumption that development of the Upper Basin by European man has resulted in significant increases in the phosphorous concentration that helps to cause poor water quality in Upper Klamath Lake. * We are being asked to assume that the declining numbers of sage grouse are the result of loss of habitat due to cattle grazing. * we are being asked to cooperate with the regulation of groundwater by the Oregon Water Resources Department based on a regional computer model that can only be described as fraudulent"
Reclamation biologists to keep jobs, H&N, posted to KBC 5/4/13. ".. Murillo wrote that Phillips’ memo will be rescinded with an apology..."
Who did the spotted owl studies? Former Yurok forestry director released from jail; Raymond accused of embezzling tribal funds, posted to KBC 3/7/13. "Raymond and two biologists are accused of using an elaborate system of fake invoices, false purchase requests and electronic bank transfers to embezzle more than $870,000 in federal funds from the Yurok Tribe during a three-year period of wildlife preservation studies." (these included faked spotted owl studies). Klamath Falls - Biologists, Reclamation clash over jobs, H&N, posted to KBC 2/25/13. "The complaint focuses on two scientific issues: (1) the discovery of greater-than-anticipated numbers of endangered sucker in Lake Ewauna, and (2) a life-cycle model of threatened coho salmon, with preliminary results indicating that tributary flows are more important than the main Klamath River, whose flows are managed by Reclamation." Klamath dam science Whistleblower and Siskiyou County Supervisor, I Spy Radio, "Last year, we interviewed Dr. Paul Houser, who's become known as the "Klamath Whistleblower" for his efforts to expose how the Bureau of Reclamation was misrepresenting the science behind the effort to remove four perfectly good hydroelectric dams on the Klamath River. We wanted to get an update from him and also talk with Marcia Armstrong, a Siskiyou County Supervisor, to hear first hand what they've been up against." Audio HERE posted to KBC 1/28/13. 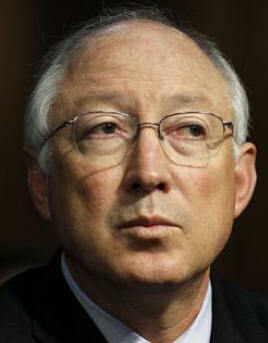 Interior Secretary Ken Salazar to resign, Fox News 1/16/13. "His departure marks the latest in a series of high-profile resignations from the president's Cabinet. Labor Secretary Hilda Solis, Treasury Secretary Tim Geithner, Secretary of State Hillary Clinton, and Defense Secretary Leon Panetta are among those leaving." KBC NOTE: 8 scientists, including the top ethics scientist/whistleblower for Bureau of Reclamation, recently filed complaints against Interior for science misconduct. Will this resignation make no one accountable? Flawed Science, New legal battle over Yuba River, and Klamath scientists accuse government of ethics violations, Families Protecting the Valley newsletter, posted to KBC 1/12/13. "There are similar complaints with Klamath issues where in a complaint filed this week, "a group of federal scientists...is claiming U.S. Bureau of Reclamation officials are threatening to eliminate their jobs because the agency was unhappy with their scientific conclusions." What would those conclusions be? Might they be finding evidence that destroying the dams isn't the correct decision? As a matter of fact..."
***BOR (Klamath Fisheries) biologists fight for jobs, Scientists say Reclamation wants to suppress their findings, H&N 1/8/13. "The complaint identifies specific research that Phillips found problematic. One area was a finding of higher-than-anticipated populations of endangered sucker in Lake Ewauna. The complaint suggests this may have complicated a view that Lake Ewauna was essentially a dead-zone for fish moving downstream from Upper Klamath Lake. The U.S. Fish and Wildlife Service reportedly had to re-evaluate its recovery strategy for Lake Ewauna and the finding led to assertions that others’ work had been proved wrong. A second problematic and disputed point of research was a study of threatened coho life-cycles. The biologists argued tributary flows were more important to these salmon than mainstem Klamath River flows. Mainstem Klamath River flows are controlled by Reclamation through the Klamath Project and a series of PacifiCorp-owned and operated dams. Phillips decided not to allow the life-cycle research to be published after the National Oceanic and Atmospheric Administration raised concerns regarding this model, the complainants assert." Seven Southern Oregon Fisheries Biologists Allege Censorship, Coercion, NW Public Radio 1/8/13. "Biologists with the Bureau of Reclamation ... found a population of endangered suckerfish in a part of the river other agencies considered a dead zone. The biologists say their manager criticized them for “proving others wrong.” Then, they say, their manager announced plans to reassign them and outsource future fish studies." Letter from Stephen Koshy, Civil Engineer, Scientist and Administrator, to KBC News regarding devastating consequences of Klamath dam removal, 12/27/12. "I have not heard from the Board of Supervisors or the County Counsel. I gave clear concise and precise engineering analysis that at current technology, the dams can not be breached as long as the 'impervious clay core' of the earth dams are saturated in water. There is no way to safely breach these earth dams, ever. The other issues are regarding the stability of slopes and the sediment." * U.S. Department of the Interior ignores scientific data supplied by Klamath Bureau of Reclamation and closes down their further participation in fisheries data collection. Tailoring wolf "science" to justify political ends, by Jim Beers, a retired US Fish & Wildlife Service Wildlife Biologist, Special Agent, Refuge Manager, Wetlands Biologist, and Congressional Fellow. Here for for KBC News Wolf Page. Posted 12/5/12. The Yurok Grift, Questions linger in million-dollar embezzlement scheme after fugitive surrenders, North Coast Journal, posted to KBC 4/14/12. "Field had already figured out that the Mad River Biologists invoices submitted for spotted owl research were fakes...an associate at Mad River Biologists acknowledged that they hadn’t conducted the surveys in question." 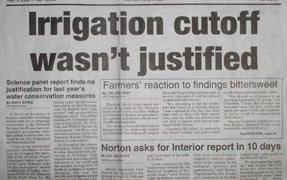 Former Yurok forestry director pleads 'not guilty' to embezzlement, Times Standard, posted to KBC 8/16/12. "Raymond and his two co-conspirators are accused of using an elaborate system of fake invoices, false purchase requests and electronic bank transfers to embezzle more than $870,000 in federal funds from the Yurok Tribe during a three-year period of wildlife preservation studies." Humboldt: Federal charges against former Yurok forestry director over $1 million embezzlement, The Times-Standard, posted to KBC 8/15/12. "Raymond, LeValley and McAllister used an elaborate system of fake invoices, false purchase requests and electronic bank transfers to embezzle more than $870,000 in federal funds from the Yurok Tribe during a three year period of wildlife preservations studies... The surveys that allegedly were never conducted primarily purported to be for spotted owl research..." HERE for Science Misconduct page. * KLAMATH DAMS: Full Committee Oversight Hearing on "Oversight of the Actions, Independence and Accountability of the Acting Inspector General of the Dept. of the Interior." Attorney General Miss Kendall questioned by California U. S. Congressman Tom McClintock regarding whistleblower Dr. Paul Houser, Bureau of Reclamation top scientist and Integrity Officer overseeing Klamath Dam science. For exposing integrity issues of the Department of the Interior he was fired by his boss, who happened to be a member of a stakeholder's group advocating for dismantling Klamath River dams, a huge conflict of interest. Listen to the astounding audio of Kendall's responses to McClintock. HERE for Koshy's website including his biography and letters on Snake and Columbia Dam destruction. Don’t need to be a scientist to know it’s bogus, H&N letter to the editor by Jerry Anderson, Klamath Falls 4/29/12. "The official EIR/EIS Klamath dam removal document) is full of such “bogus” science; hence Dr. Paul Houser, whistleblower." CORRECTION: This page has been corrected: Dam Removal Would Be Catastrophic, interview of scientist Stephen Koshy, DRA, posted to KBC 3/31/12. Koshy is a civil engineer, scientist and administrator. Related letters by Koshy: Scientist: Removing Klamath River dams" is not safe or doable." Renown scientist Stephen Koshy letters to Siskiyou County Supervisors and Thomas Hepler, P.E., Bureau of Reclamation team leader of Waterways and Concrete Dam Group: "My earlier comments on November 18th provided scientific proof that the proposed action to remove Iron Gate dam and J.C. Boyle earth dam, is not safe or doable. The dams would collapse catastrophically..."
Alleged embezzler Roland Raymond surrenders to authorities, IndyBay, posted to KBC 3/7/12. "The case stems from ... investigation of over $870,000 in Federal funds appropriated to the Yurok Tribe for wildlife preservation, including the spotted owl research project"...""The science used for implementation of these MLPA (Marine Life Protection Act) closures needs to be fully and independently investigated and verified, following Mr. LeValley's felony arrest. Until then, none of the science in this DEIR can be considered valid..."
Klamath Dams - Reclamation fires top scientist and Scientific Integrity Officer for exposing Interior's scientific fraud, by Oregon Senator Whitsett 3/14/12. Here for Dr. Paul Houser page. Biologist embezzlement case may go federal, Times-Standard 3/14/12. (KBC NOTE: these scientists were involved in spotted owl research). Biologists for hire sell opinions, Times-Standard 3/14/12. "...arrest of Mad River biologists Ronald LeValley and Sean McAllister on charges of using phony spotted owl surveys to embezzle funds from the Yurok Tribe should lead to an in-depth discussion of the long-standing method of obtaining a scientific consultation for any resource project." Allegation of scientific and scholarly misconduct and reprisal for a disclosure concerning the biased summarization of key scientific conclusions for the Klamath River dam removal Secretarial determination process, from Dr. Paul R. Houser, Science Advisor and Scientific Integrity Officer, Bureau of Reclamation, Washington D.C., to Office of the Executive Secretariat and Regulatory Affairs, Department of the Interior, posted to KBC 2/27/12. "This Klamath dam removal Secretarial determination is reported to have a cost to the public (taxpayers and ratepayers) in excess of $1B, so a misinformed or premeditated decision could be a gross waste of funds." U.S. plans to kill barred owls to save spotted owl, San Francisco Chronicle 2/29/12. "The government set aside millions of acres of forest to protect the owl, but the bird's population continues to decline - a 40 percent slide in 25 years." According to Siskiyou County Sheriff Lopey at Saturday's sheriff meeting in Yreka, in the early 80's there were over 22 lumber mills, and now only 2 are functional, and 65% of land in the county is public land. Endangered Species Act / ESA mandates locked up the forests to save the spotted owl. It devastated Siskiyou economy, they have one of the highest unemployment rate. KBC NOTE: Sacrificing the forest, wildlife and owls by rampant wildfires, and communities and economies, all by false science, did not save the spotted owls. HERE and HERE about 2 esteemed spotted owl scientists. Below conspiracy and embezzlement by Spotted Owl "Scientists"
Shock, disbelief follow arrests: Biology community has trouble digesting embezzlement allegations, The Times-Standard 2/26/12. "The Del Norte District Attorney's Office is alleging that, under the direction of Raymond, Mad River Biologists billed the tribe for almost $900,000 of northern spotted owl surveying work on tribal lands that was never performed. An affidavit in support of a search warrant filed by district attorney investigator A.C. Field indicates there is a long paper trail supporting the allegations, complete with checks from the tribe cashed by McAllister, receipts of large cash withdrawals, transfers to LeValley's personal account and checks sent from LeValley to Raymond." Former Yurok employee, Eureka biologists allegedly embezzle tribal funds; Del Norte DA's Office said more than $900,000 stolen, Times-Standard 2/24/12. "warrants were issued for the arrest of former Yurok Tribe Forestry Director Roland Raymond, senior biologist Ron LeValley with Mad River Biologists and associate biologist Sean McAllister with Mad River Biologists...Raymond was named director of the year in 2009, ... In addition, a book by Save the Redwoods League called “The redwood forest: history, ecology, and conservation of the coast redwoods,” lists Raymond as a contributor....alleged embezzlement is related to spotted owl research by Mad River Biologists...Co-conspirators LeValley and McAllister both work for the Eureka-based biology company...LeValley founded the company,he presently serves as treasurer of the Pacific Seabird Group, as an associate editor for Western Birds, and as California coordinator of the Pacific Coast Joint Venture." 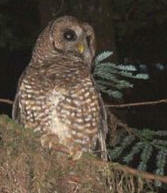 McAllister ...expertise in the field is with local threatened and endangered species, such as the Northern spotted owl." Co-Chair of MLPA Initiative Science Advisory Team Arrested, by David Gurney Feb 25th, 2012, Indybay. 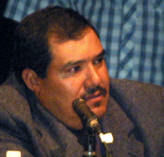 "...Sean McAllister, and former Yurok Tribe forestry director Roland Raymond, conspired to falsify invoices for spotted owl research, and embezzle funds for their personal use....Mr. LeValley was a key figure in the cover-up of a whale-strike incident in October, 2009 involving an MLPA "Initiative" sonar mapping vessel off Fort Bragg, California. The arrest will undoubtedly bring up more questions as to the integrity of the science, financial practices, and public policy procedures of the totally corrupt MLPAI "Initiative" to create so-called "marine protected areas" on the California coast." KBRA/Klamath Dam Removal: The science: Scientists say they have no agenda, H&N, posted to KBC 2/24/12. Included by KBC are reports by scientists David Vogel, Dr Ken Rykbost, Dr. John Menke, and also Klamath Water Users Association, exposing the unethical unscientific agenda-driven "scientists"
Scientists find holes in Klamath River dam removal plan, $1.4-billion project — dismantling four hydroelectric dams to restore Chinook salmon runs in the upper Klamath River — amounts to an experiment with no guarantee of success, independent report says. L. A Times 6/25/11. Our government destroyed a Mexican immigrant's farm, and his son is fighting for freedom in Iraq, by KBC, AgLifeNW 2004.